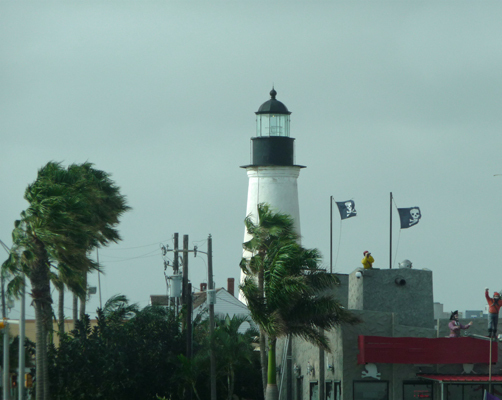 On Sunday December 29th, as we drove off of South Padre Island, I managed to get a photo of the Port Isabel Lighthouse which is right at the foot of the bridge between Port Isabel and South Padre. It’s got a pirate restaurant next door and it no longer has a lens or a light, but it’s still a lovely lighthouse. We drove through the port of Brownsville and into Brownsville proper to camp for a couple of nights at Honeydale Mobile Home and RV Park . We got a decent spot with great free WiFi reception for just $18 a night with our Passport America pass. The weather turned just after we arrived in Brownsville and the temperature dropped to 55 degrees with wind out of the north (when it had been 80 with the wind from the south before). The wind blew all night but died down to a stiff breeze in the early morning hours. On Monday December 28th, we awoke to sunny skies and light breezes. Yipee! 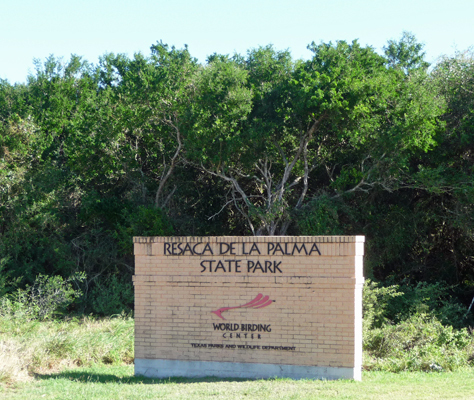 We did a few chores around the trailer and then packed a lunch to take with us to Resaca de la Palma State Park, yet another of the parks in the World Bird Center system. We managed to find the place with a little trouble (they had the road from the south closed so we had to break down and ask the GPS how to get there). We arrived only to find that the visitor’s center isn’t open on Monday or Tuesday so we had to park outside the gate in a dirt parking area. They had maps and trail guides at the kiosk by the gate so it wasn’t a problem. We signed in with our State Parks pass (saving us $8 since entry is $4 per person) and walked up the drive to the visitor center area. There is a big grassy area around the visitor’s center and when it’s open they have bird feeders out. Clearly the birds still check the feeders even when they haven’t been filled because I got a quick sighting of a green jay in this area. We checked the area out where the bird blinds were and saw a few doves but nothing much else. Then we hiked out the Ebony Trail to see what we could see. First off there were Texas Ebony Trees. 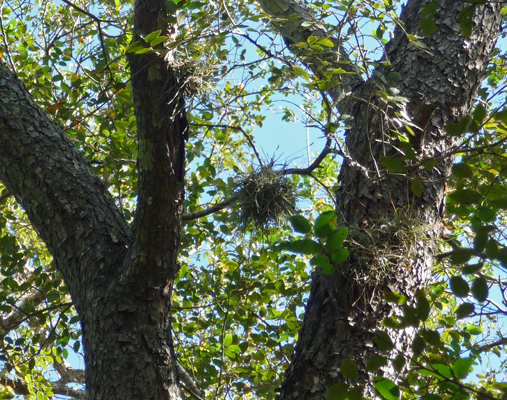 There were a few nice little nature ID signs here and there, including one for Bailey’s Moss Balls. Don’t they look like Christmas ornaments made of moss? The Ebony Trail leads out to a Resaca—an oxbow or portion of the Rio Grande that has gotten cut off by silt and left as a long narrow pond. 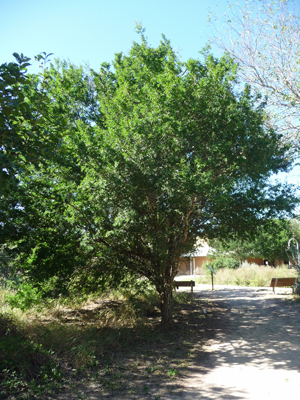 200 years ago the entire Brownsville area was filled with these resacas and thickets of Honey Mesquite and Texas Ebony like the one you see here. 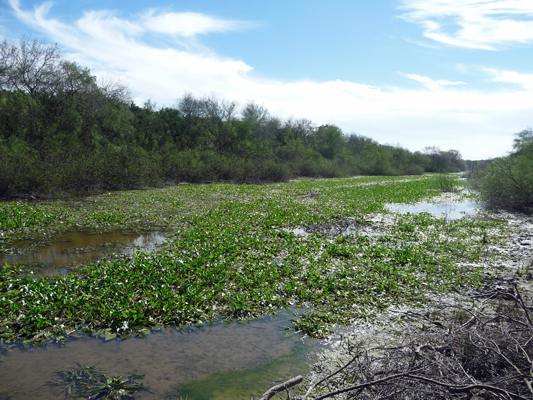 But the thickets have been cleared for farming and development and only some of the resacas remain, mostly as water features in developments. This state park is an effort to preserve the ecosystem which has supported so many birds here for so long. There were very few birds out in this resaca. There was a female Redhead duck fishing and I caught her with her catch in her mouth. She spent a lot of time working with this fish. I don’t know if it was putting up a fight or she was just playing with her food. Redheads are diving ducks so once she got the fish down she’d dive down and disappear and then reappear 10 or 15 feet down the way. 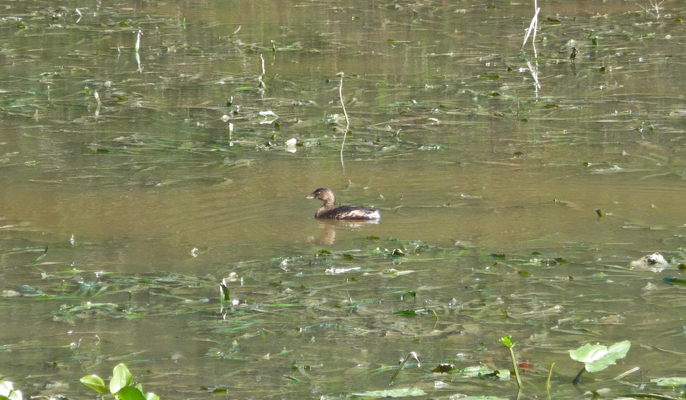 We also spied a couple of these little brown jobs (LBJ’s in birder parlance—for little birds you have trouble identifying). I spent a long time with my bird book and I still don’t know what she is. 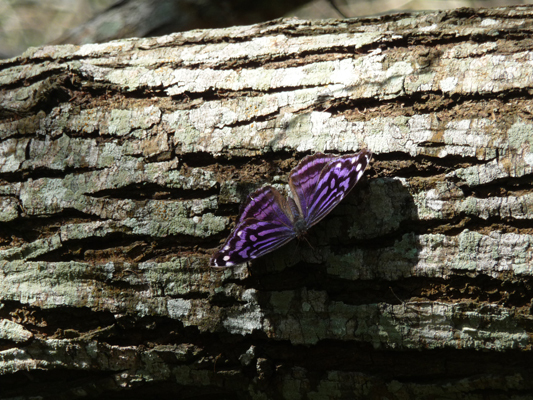 Walter spied this lovely Mexican Bluewing butterfly on a branch in the woods on the way back. When they close their wings up they are exactly the color of the tree bark—perfect camouflage. 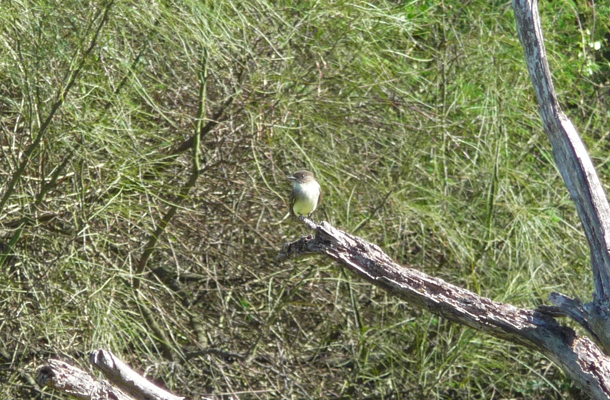 We walked part of the road in the park to see if we could see any other birds. When the visitors center is open there’s a tram you can ride to reach the trails that are further out in the park. But it wasn’t running so we walked a ways. We saw a few small ducks and a few flashes of color in the trees but nothing much. We turned around when we realized that lunch was calling. 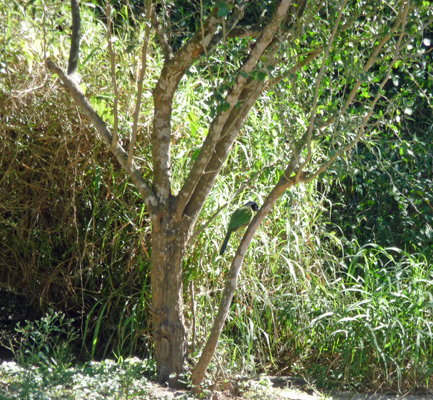 When we got back to the visitors center we noticed that there were green jays flying between the trees out front. 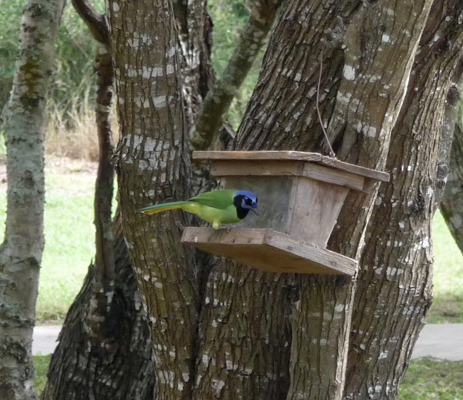 I quietly crept towards them and discovered there were several green jays visiting a bird feeder in one of the trees. And several more feeding on the dropped seed on the ground along with some doves. Aren’t they amazing looking birds? South Texas is the only place in the US that you can see them. And it was worth the outing to get to photograph them here. 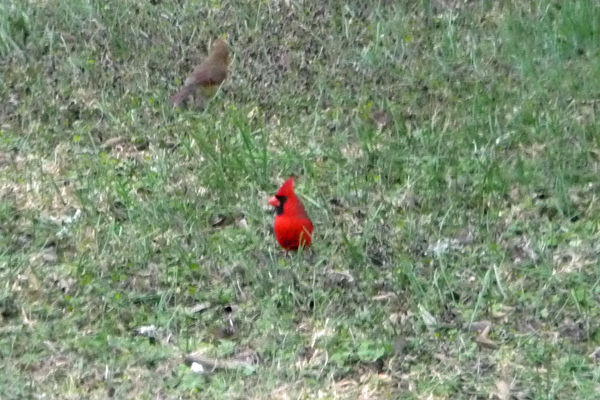 In addition, there was a cardinal to add to the color. 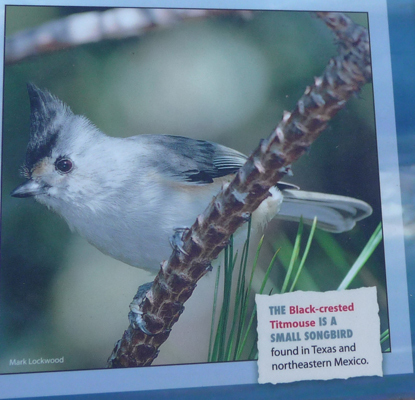 There was a really cute little black-crested titmouse flitting about in the trees too but he didn’t stay still enough for me to get a decent photo of him. Don’t you just love that little top knot? We got hungry so we hiked back to the car to have lunch and then drove into town to do some grocery shopping. We visited our first H.E.B. super store and were overwhelmed with people and grocery choices. These folks are going head to head with WalMart in the grocery business and this is southwest Texas so the food choices are very Hispanic—an entire aisle of tortillas and a bakery department that makes fresh tortillas and tortilla chips on site—and fresh turmeric bulbs in the produce department. But not a Chinese pea pod to be found in the huge produce department. 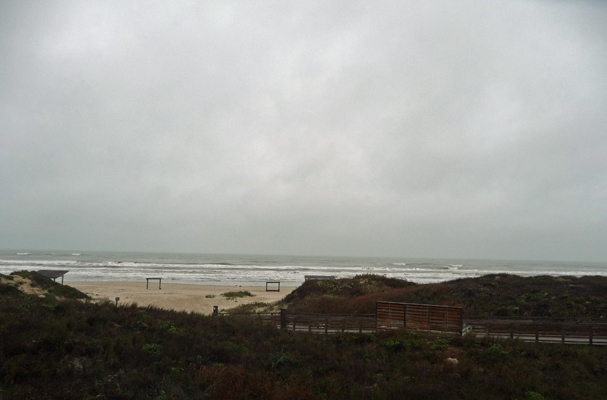 On Tuesday December 29th, we packed up and drove northeast to Corpus Christi and then out the bridge to Mustang Island State Park. It was cloudy, windy (10 mph winds) and 60 degrees when we arrived. Thank goodness, we got a water and electric spot okay and it only cost us $15 a night with our Texas Parks Pass (first night $20, second night $10 and our individual daily fees paid by the pass). It rained lightly off and on that afternoon and evening and we enjoyed ourselves safe and dry in the trailer with the park’s free WiFi working about 50% of the time. Tuesday night it rained hard enough so we had giant puddles of standing water all over the campground. It rained lightly for most of the day so we didn’t hurry to get out in it. We had a flock of red-winged black birds out in the grass outside the trailer and they provided a bit of entertainment for a while. We finally got it together to go out for a drive since it was clearly not going to stop raining soon. We drove out to the Day Use Area at Mustang Island State Park to see what we could see. The only people out on the beach were people walking their dogs. You can see what I mean about giant puddles. Then we drove out to the beach camping area just to get a different look of things. Here you can drive out onto the beach and camp on the sand—but no one was doing it since it was just too cold and wet. And there was no one out in the water either. 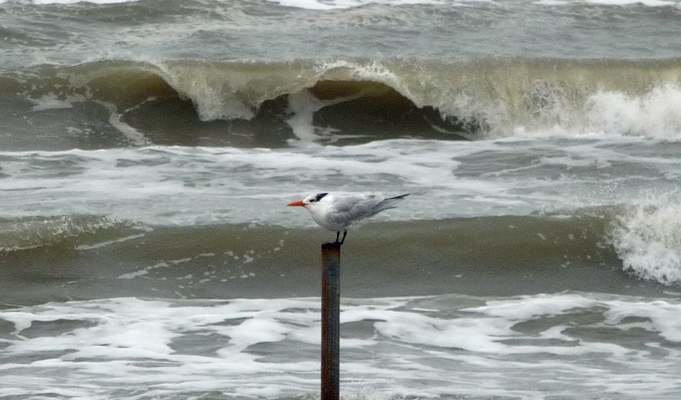 We drove the other way and visited the fishing jetty and I spied a Royal Tern sitting on a piling. 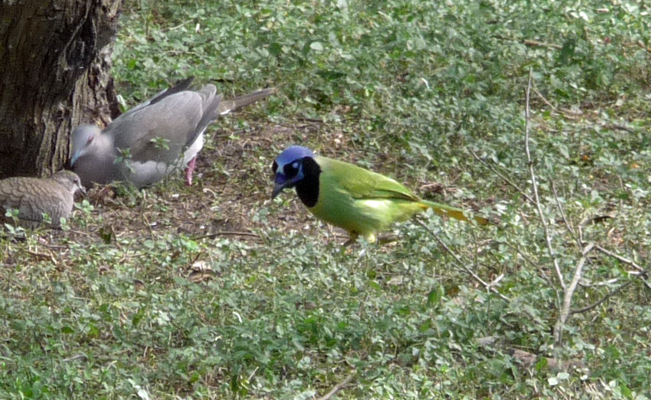 They aren’t common enough to have made it into my new Texas bird book but they are listed as relatively common on the barrier islands (like Mustang) so there you go. 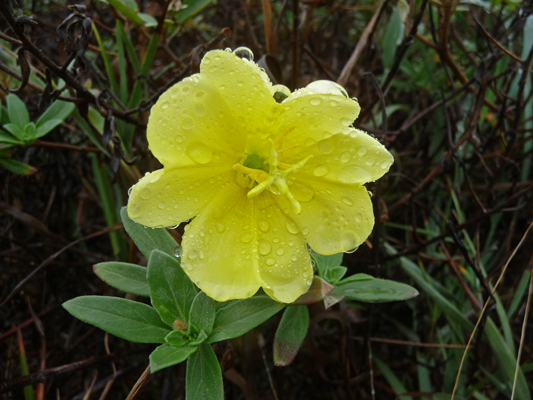 Along the dunes on our way out to this beach I spied some Beach Evening Primrose (Oenothera drummondii) in bloom. I just love having flowers in bloom in December. 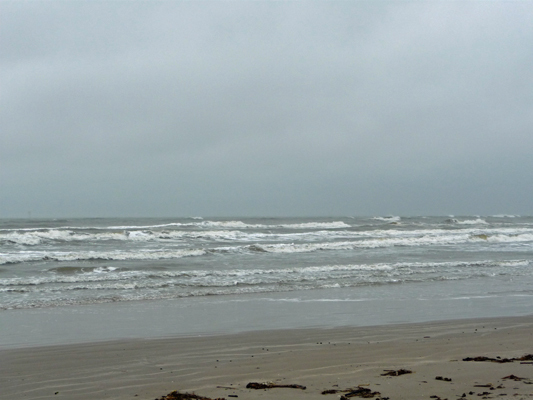 We set off heading north (on the one and only road in these parts) up to the tourist town of Port Aransas. There are condo developments and upscale beach houses along the way and Port A (as it’s called here) is a much classier town than South Padre Island was. It was also much more alive than South Padre was just a few days before. 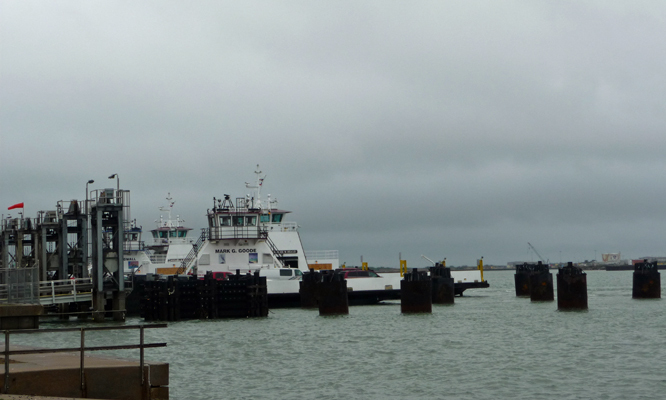 You can get to the mainland from here by taking a free car ferry—one that appears to hold about 9 cars. Since the wait was 1/2 hour in the middle of the day, we decided that we’d go the long way (it’s about 20 miles further but a good 1/2 hour faster according to Google Maps) when we left the island the next day. 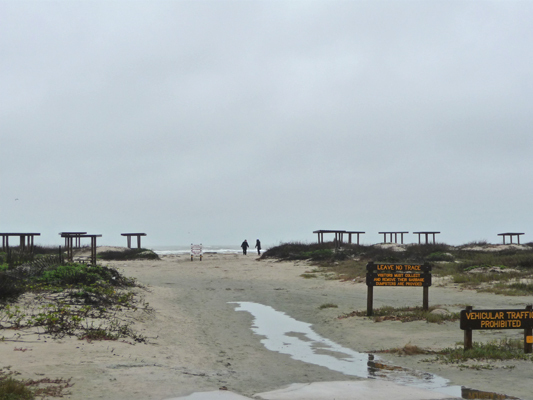 We went back to the trailer for lunch and then took the drive south through the built up area near the bridge to Corpus Christi and on down to the Padre Island National Seashore. The seashore preserves the longest undeveloped stretch of barrier island left in the world. The road takes you a few miles into the seashore to a Visitors Center and a nice campground with views of the ocean. If it weren’t so cold and wet we would have been happy to move down there for a couple of days. But sitting around in the rain at 54 degrees without electricity isn’t much fun so we took a pass. We stopped in at the Visitors Center and I bought new Texas bird and wildflower books and Walter bought me a nice Padre National Seashore t-shirt since a number of my t-shirts died in the laundry a few weeks ago (the joys of Laundromats). The we went out to the observation deck in the light rain to see what we could see. There’s a nice walkway that takes you down to the sand and there were a few folks braving the elements to walk on the beach—one lady came back up with wet hair saying it wasn’t just rain, it was sea water too from the wind. I took a panorama shot from the higher level of the observation deck. I can well imagine that this is a busy place on a beautiful sunny day. The area became a National Seashore back in 1962 and since then the native plants have begun to re-stabilize the dunes. Before that, they had run cattle here and they’d eaten everything off the dunes and erosion was a major problem. They are striving to have the island return to its natural state thereby protecting Corpus Christi even more from the impacts of hurricanes. We drove to the end of the road (not very far from the Visitors Center) where you can drive out onto the sand—and continue the length of the island some 60 miles southward if you don’t get stuck. 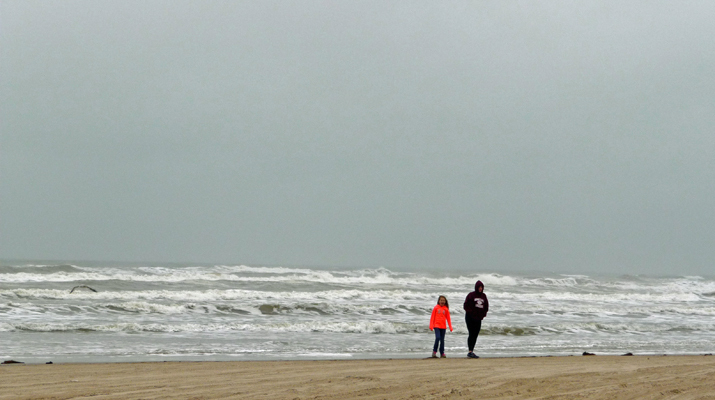 It was cold and wet but there was great surf. On New Year’s Eve day, we packed up one more time and headed over the bridge into Corpus Christi and then north to Goose Island State Park. On our way over the bridge out towards Rockport, I got this shot of the USS Lexington with a bunch of older planes parked on her flight deck. You can take tours of her if you’re in Corpus Christi. 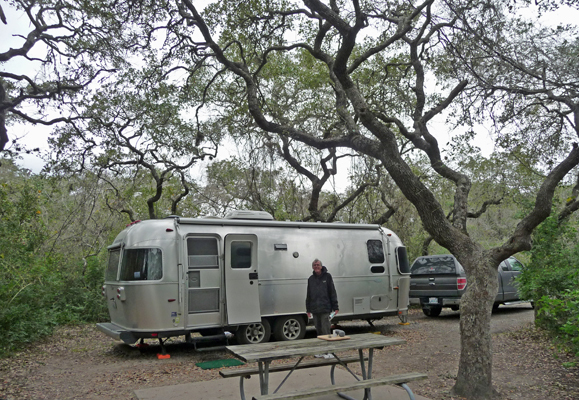 The bay-side camp spots at Goose Island were full for the weekend but we got a nice water and electricity spot in amongst the coastal oaks for a couple of nights. There was supposed to be free WiFi here but we were just too far from the antenna I guess. Our hot spot barely worked the first afternoon and once it began to rain again we lost that signal too. We’ve now camped for 7 nights at Texas State Parks and visited one Day Use Park and already saved $106 using our $70 state parks pass. Netting out $36 savings in less than 2 weeks isn’t too bad and we have many more State Parks visits ahead of us. It was most certainly a good deal for us. There were lots of these little red berries scattered along the branches of the shrubs in our campsite. 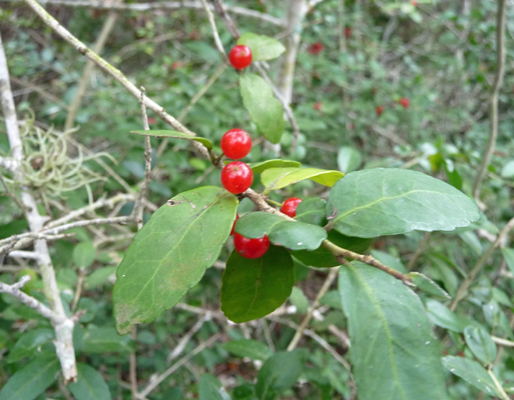 They turn out to be Yaupon (Ilex vomitoria) a native holly tree. 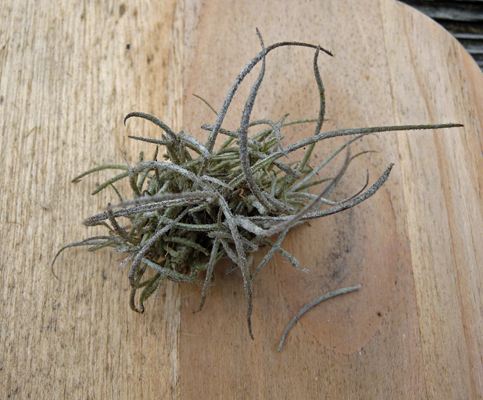 And there were small Bailey’s Moss Balls scattered on the ground. They are totally fun to play with—light and springy. After lunch we decided we better take a short exploratory trip while we could since it wasn’t raining and the forecast for the next few days was pretty wet. 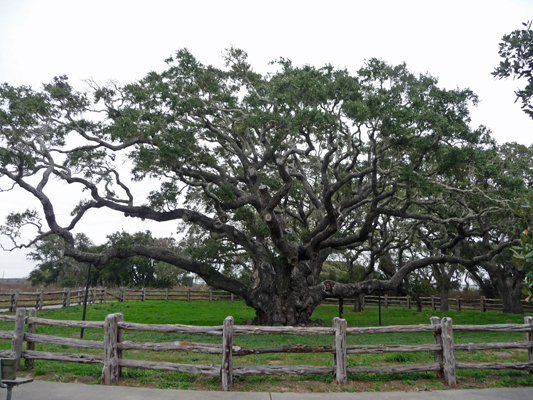 We drove out of the park to visit the Big Tree section of the park which protects a 1,000 year old coastal oak which is one of the largest of its kind. It’s trunk is 35 feet in circumference while it’s 44 feet tall and 89 feet across at the crown. While we were looking at the tree, a fellow walked up to us and asked us if we’d ever seen whooping cranes. We’d heard there might be some in the area and he confirmed it and sent us back across the road from the parking lot for a view. There were three whooping cranes (an endangered species) and 3 sandhill cranes along with a whole bunch of redhead ducks. They were quite a ways away so I was grateful any of my photos came out at all. 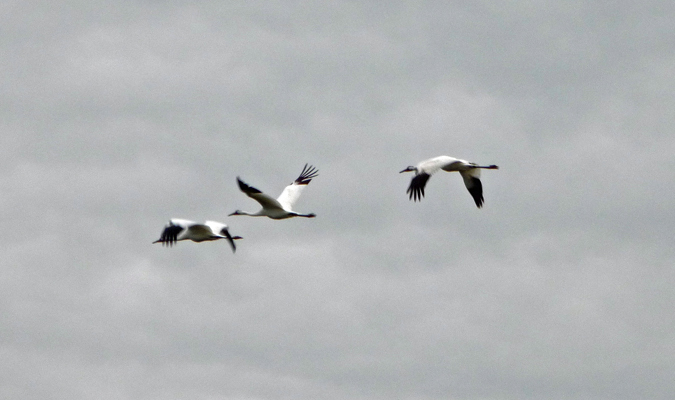 The 3 whooping cranes were probably a family unit from what I’ve read. Just as I was turning to go, something startled them and they took off flying right towards us. Whoopers are the tallest birds in North America with wing spans of 7 and a half feet—BIG birds. Back in the 1940’s there were only about 40 of them left in the country—all nesting in this area. Now the population has reached over 100. On our way back to the park we saw another 3 on the other side of the pond where we saw these but they were so far away the photos didn’t come out at all. There were duck hunters out in the bay in blinds and we noticed a lot of camo-gear hanging on the porches of the small beach houses in the area. Clearly it was duck hunting season. 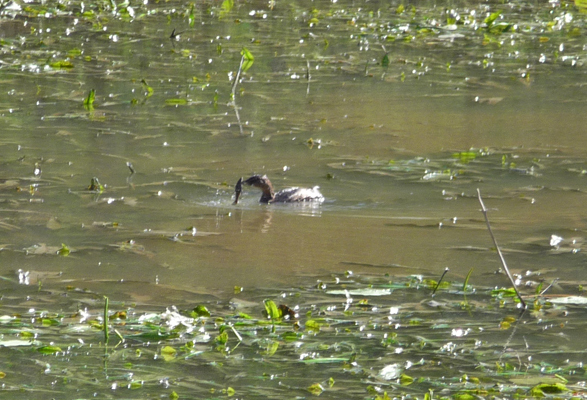 We saw tons of redheaded ducks in the park but they’re diving ducks and eat fish so they tend to taste pretty fishy. Folks mostly hunt for ducks that eat seeds since they taste better. 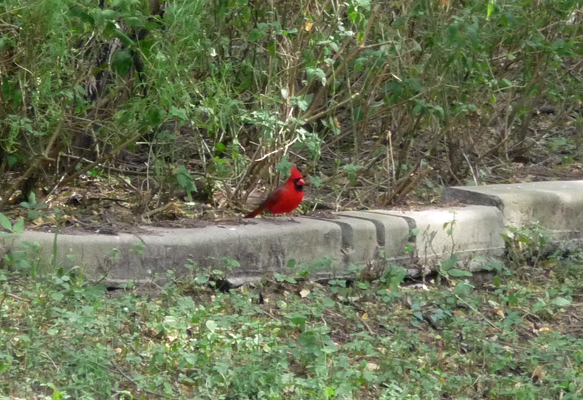 We took a little driving tour of the park and Walter spied 4 cardinals in the grass—2 males and 2 females. One of the males took off before I got the camera out and the female is hard to see because she has such great camouflage. There were a bunch of brown pelicans on the fishing pier but they were gone when we came back later in hopes of photographing them—that’s okay you’ve seen enough of them at this point, I’m sure. When I got out to see if I could capture the fishing bridge in a photo I ended up trying to take pictures of jellyfish in the water—just as bad as fish! My camera likes to focus on the water’s surface not things below the surface. In any case, they were pretty cool white jellies. It began to rain in the early evening and kept it up all night and all the next day. The high on New Year’s Day was 46 degrees quite the change from the week before when it was in the high 80’s. It felt as if we’d experienced summer, fall and winter all in less than a week’s time. Friday we took a drive down to the town of Rockport just to get out for a while and it was pretty much shuttered up on New Years Day. We saw an egret here and there but nothing else much. There are lots of really nice houses along the bay here and I’m sure it’s really a hopping place in nice weather but not on a wet cold New Years Day. We heard a lot of fireworks being shot off on New Years Eve even with the rain. Nothing seems to stop folks from making things go bang when they want to celebrate. Saturday we drove a whopping 6 miles to change campgrounds so we could get a decent internet signal and do some laundry. 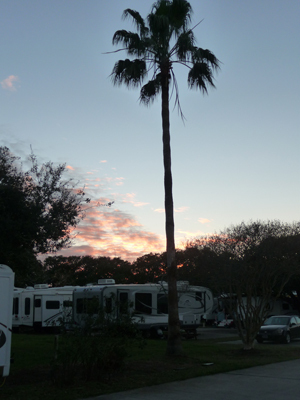 We ended up at Wilderness Oaks RV Park in Rockport, TX where we got a nice full hookup site for $17.50 a night with our Passport America pass. We’ll stay here for 3 nights, get caught up on the internet, do laundry and grocery shopping and hopefully have some decent weather on Monday to visit the Aransas Wildlife Refuge where most of the whooping cranes live. By Sunday afternoon the sun had begun to peek through the clouds and it had nearly cleared off by sunset. The forecast is for weather in sunny weather in the 50’s on Monday. Whoo Hoo. We traveled a long way this year (I don’t know how many miles but the truck now has 35,000 miles on it and it was new in May 2014 before we set out. ) We started the year in January in El Centro CA wandering through the desert in California and Arizona and then back up to the NW and on to Idaho for the summer and then leaving in late October to go back down through CA, Arizona and New Mexico to make it to the Texas Gulf Coast.